It's now live: the new website from TROX TLT. The intentions for the new website can be summed up in two terms familiar to web experts: "user-centred" and "responsive design". What do these keywords used by web designers really mean? Quite simply: more than ever before, our users are at the heart of our interactive systems, thanks to innovative technical capabilities in website programming and to the contemporary screen design with improved layout. This is expressed in the logical, transparent user guidance which is oriented, first and foremost, towards the target user group. For instance, the user chooses their field of activity – such as designer, architect or installation engineer – from the menu item "Expertise fields". This filter takes him quickly to the information that has been compiled specifically for people in his occupational category. Searching for specific information is simpler and more convenient too, owing to integrated Google Search technology and also to the new intelligent filtering function in the product finder, for example. Optimising website operation and user guidance means, moreover, that it is possible to provide highly detailed product information while nonetheless making it easy to find. New programming technology means that website content is automatically adapted to the size of the browser window. Support for mobile terminal units such as smartphones and tablets makes information about TROX TLT mobile and therefore also accessible on site. TROX TLT GmbH, a subsidiary of TROX GmbH, has more than 140 years of expertise in the development and manufacture of fans for building services engineering. TROX is the leader in the development, manufacture and sale of components and systems for the air conditioning and ventilation of rooms. With 29 subsidiary companies in 28 countries on 5 continents, 14 production facilities, and importers and representatives, TROX is present in over 70 countries. 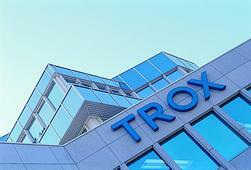 Founded in 1951 and with a staff of 3,700 employees, TROX generated sales around the globe of €482 million in 2015.